Diet Coke is getting a makeover. On Wednesday, January 10th, 2018 the iconic soda brand announced that after 35 years Diet Coke is entering a new era. The formula is staying the same, but it’s getting a new look and four new additional flavors. The long-running brand is attempting to appeal to millennials, and dare we say trying to be more like La Croix. The new branding has a colorful, zesty vibe à la the uber-popular La Croix, and according to the same press release, the new flavors are Ginger Lime, Feisty Cherry, Zesty Blood Orange, and Twisted Mango. It makes sense that Diet Coke would edge closer to the sparkling water giant — according to Vox, “In 2015, people in the U.S. drank 12.4 gallons less soda per person than they did in 2005,” and sparkling water consumption increased 58 percent between 2010 and 2014. Meanwhile, Business Insider says that diet soda sales have dropped 34% since 2005. It’s a bad time to be a diet soda. In recent years, La Croix has captured the hearts and minds of millennials and has become the ~cool~ carbonated beverage. We’re definitely intrigued by these new flavors. 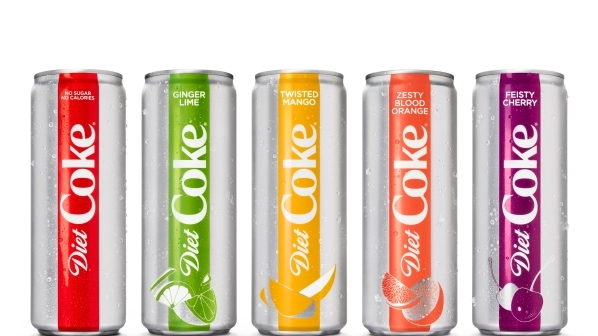 A dark diet cola that tastes like ginger and lime? Sign us up!